Session hosted by Barbara Hoisl at the upcoming Software Product Summit – April 17-18, 2018 in Frankfurt, Germany. Software product summit is a new international conference dedicated to the management of software products, including software-intensive products, such as smart, connected products or products for the Internet of Things (IoT). I’m very much looking forward to hosting a session to discuss how portfolio management is used to support innovation management efforts. And specifically, what that means for product managers who frame investment requests for consideration in a portfolio management process. How is portfolio management related to innovation management? Portfolio management is about allocating resources among competing investment proposals, e.g. among all requests for funding initiatives within a business unit. However, when competing in fast-moving, constantly changing markets, as many software products do, portfolio management serves a second purpose: it becomes an important tool for innovation management. Portfolio management activities are typically performed periodically and provide the opportunity to develop an up-to-date picture of the market, with a special focus on changes in the market. Based on this, portfolio management can make the right allocation decisions to ensure the portfolio stays relevant. In fast-changing markets, this requires a focus on innovation. How can organisations ensure a focus on innovation in their portfolio management processes? To ensure this focus on innovation, software portfolio management may use the concept of three time horizons that Geoffrey A. Moore adapted to fast-moving high-tech and software markets. To ensure long-term success of the organization, the portfolio should be balanced in the sense of having all three time horizons adequately covered. What does it mean for software product managers? 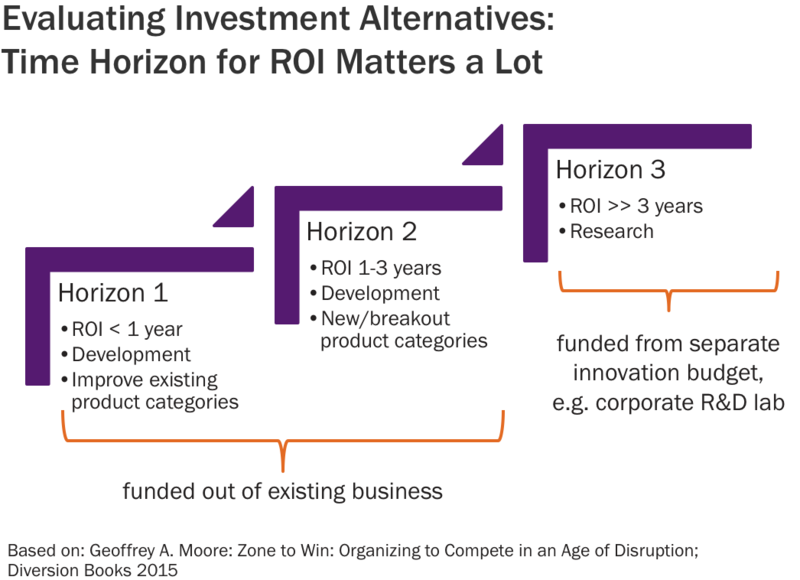 For software product mangers, it is important to understand how portfolio managers think and in particular to understand the difference between Horizon 1 and Horizon 2 investment requests. Based on this understanding, they can better frame their requests for investment, both for existing products or for new product initiatives. If that sounds interesting to you, I’d love to hear from you: send me an e-Mail or let’s meet at the Software Product Summit (registration).